This 1985 book comprises the papers presented at the symposium of the Internation Union of Theoretical and Applied Mechanics, Sheffield April 1984, held in memory of the late J. D. Eshelby FRS, Professor of the Theory of Materials at the University of Sheffield. The papers reflect the range of Professor Eshelby's interests. Topics include conservation laws and their applications; inclusions, inhomogeneities and composites; short cracks; the dynamics of dislocations and cracks; dislocations and point defects; and creep fracture. There is also an obituary of Professor Eshelby, together with a complete list of his publications. 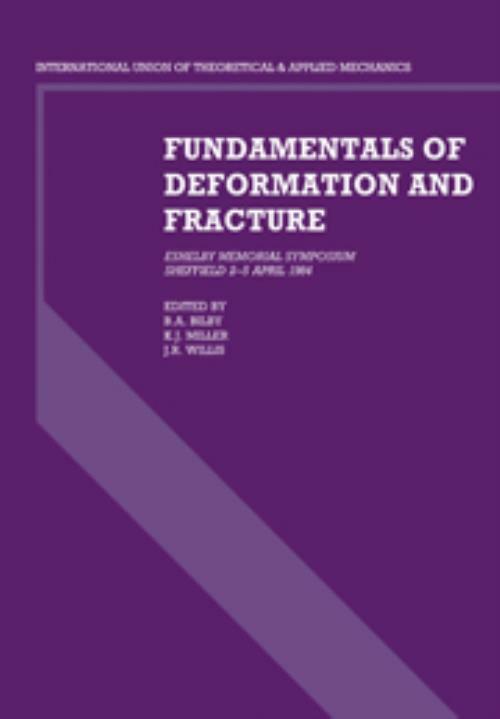 The 45 papers in this volume provide an international survey of work in the field of deformation and fracture, with theoretical examinations, reports of empirical investigations and descriptions of experimental techniques. It will be of interest to professionals and researchers in the science of materials, mechanics of solids and mechanical engineering and to related areas of science and technology to which Professor Eshelby contributed both directly and by inspiration. 44. Slip and cleavage from blunted cracks J. E. Sinclair; Author Index.